Now that OS X 10.9 is regularly appearing in usage logs, we thought we’d take a stab at the naming convention. 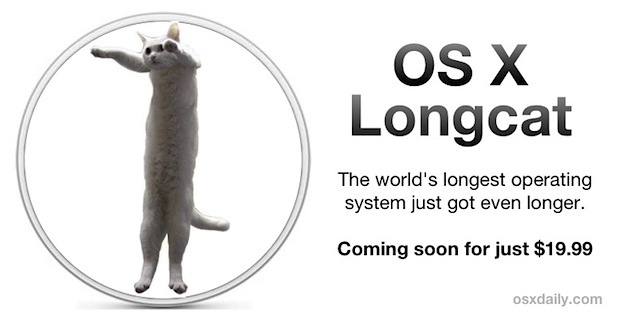 How about OS X Longcat? Yup, we’re bored today and diving straight into the pool of Longcat memes, and there’s nothing better than boredom and some Pixelmator fun to create something totally stupid. Don’t worry, we’ll be back to our normal useful selves soon here. Ha. I may be an outlier but I think Apple will abandon the cat names. We are in a transition stage as Apple edges Macs closer to iOS, sooner than later it may just be iOS X, iOS Pro, or OS XI anyway. Obviously we’ve had leopard to snow leopard and lion to mountain lion so it could be OS X Sea lion ! Next os x 10.9 will be sea lion … An OS that’s swim on the Cloud where the others drown !! Apple should switch to canine names: afterall, OS X and the entire Mac platform is going to the dogs. (It’s humor, relax fanboys). Really? I would have guessed 11. OS X Meowmix is scheduled to blend 10.8 and 10.9 seamlessly. I want chicken, I want liver, meow mix meow mix please deliver. I’m a Vermonter, so I’d have to go with OS X Catamount. I’m pulling for Cowardly Lion. It will be The New OS X … because I think that dude is still on the marketing staff. OSX: Eartha! I love it!!! I guess the naming rules of OSX are all those animals on top of the food chain and very lethal. I would bet if those big cat names are exhausted, new names will come from either eagle family in the sky or shark family under the sea.